The other day I saw a question posted to Quora where the user was asking "Why do I need an ERP? ", and it got me to thinking. How can I answer that question, and provide proof that if you are in business, you need an ERP? 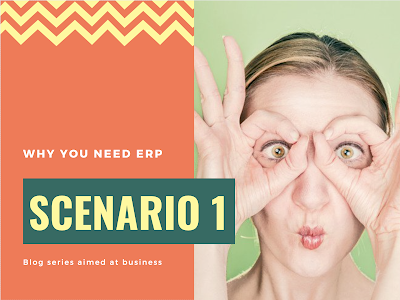 This series of Blog posts will set out to answer that question by using some scenarios where using an ERP makes sense, and helps the situation. Basically, if you don't have an ERP and you face this problem, you can overcome it with some blood sweat and tears vs handling it with an ERP system in your tool belt. Scenario 1 - What Happened to My Money? You: Thank you for informing me of this issue Fred, I will get this sorted out and call you back! Customer: How long is that going to take?? You: I should have an answer for you within the hour! You hang up the phone, and immediately login to your ERP system, for this we will assume that you are using JBitPro ERP as your tool of choice. You pull up your inventory module and search for Product-A. That is interesting, you think while scratching your head, 0 in stock! Next you look for open Purchase Orders with Product-A on them. OH NO! The last time we special ordered Product-A was last year around this time, when Fred ordered it from us last time. Now you know for a fact that Molly dropped the ball, she did not order the part when Fred called 2 weeks ago, which is a total issue to itself. Next, your not a sales person, your a manager. So what can you do? Certainly you can take actions to correct Molly, but what about the immediate issue with the customer? Quick thinking, you see on the Purchase order that you have always ordered this item from Vendor-A, and you notice that your team always speaks to Smitty...oh look there is his phone number. Dialing just as fast as you can you get Smitty on the phone and explain the situation. He is very understanding and offers to split the shipping costs with you (day dreaming here a bit) and get the product drop shipped to your customer with next day shipping! Yes this is quite a story, and really hard to imagine the amount of time it would take to track this down. But, you can see that in just a few moments it is possible to track down what happened with the item when using an ERP system. To put this into perspective, lets look at the flip side. You don't have an ERP and you try to solve the same issue. You: I should have an answer for you by tomorrow! You hang up the phone and walk out to the Sales floor, surveying the area for the sales manager. Well, he isn't in his office and isn't walking the floor....Oh wait, there is Ellen...Hello Ellen have you seen Bill? Tell him I need to speak with him ASAP, its a customer issue. Possibly an hour passes and Bill approaches you, granted his life is a mess right now since he is tracking multiple other customer issues dealing with late shipments and orders that weren't placed, or were placed late, we could go on and on... You ask Bill who was in charge of Fred's order - "I will need to get back to you on that. Let me check the purchasing drive for the purchase orders. Give me an hour or so." Bill comes back in less than an hour! He has some news, you are on the edge of your seat when he informs you that there is no PO on the purchasing drive for Product-A, and since there are hundreds, thousands even, files on that share space - he can't be sure that he over looked it. Worse yet, he doesn't know the last time your company ordered it, or who sold it to you last time! In addition, he has no idea that Fred spoke to Molly when he called to order it. Next steps? Well you could call Fred and ask who he spoke to and then ask them to order the part, and at this point might be your only course of action. But this makes you look incredibly unprofessional and unorganized! Or you could ask Bill to speak with his Sales Team and find out who knows where to get Product-A and have it shipped next day to Fred. This option will likely be the only option in the end since you need to keep the customers business and you don't want your business looking badly for a simple mistake. And, remember that fake discount and understanding vendor you spoke with in the above example, when you had an ERP system? Yea, thats not happening with a vendor you have little or no relationship with. It could happen, but most likely won't. ERP systems do so much more than manage your inventory, they save you from major catastrophes that can happen when things get messy. They help you generate relationships with the vendors and customers you deal with. And as a manager, or business owner you don't have the time to be chasing down the whose and whats. You just need the quick results, and solutions to problems. This is why you use an ERP system to manage things, it brings universal organization to a chaotic business world! If you are interested in getting an ERP system for 5 years free, then you need to Register for JBitPro today, and participate in our Beta. For a list of all our features, click HERE!